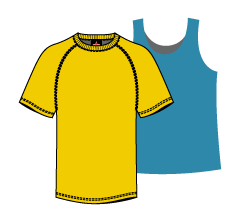 Items must be unused with all garment tags. If item(s) is returned within 30 days of purchase a full credit, exchange or merchandise credit can be requested. SCREEN-PRINTED ITEMS, EMBROIDERED ITEMS, OVERSTOCKS, BLOWOUTS AND CLOSEOUTS sales are final and no returns or exchanges are accepted. Once custom embroidery and screen print orders have been placed the order is subject to a 15% restock fee if canceled while in production. Setup cost can not be refunded and if for any reason setup charges were waived, they will be subject to charge if order is cancelled. This is a very rare situation. For orders with no custom decoration of more than 50 items or $1,000 we reserve the right to charge a 15% restocking fee for orders returned after 10 days. Has laundered, dry cleaned or washed them in any manner. Has embroidered, screen printed, tailored or altered them in any manner from their original brand new state. Has worn them beyond trying them on to check for a proper fit. Has caused stain damage to them such as those caused by sweat, spilled liquids, ink, crayons, glue or anything else that can cause staining. E-mail us at customerservice@clothingwarehouse.com. In your e-mail, please give us a brief description of why you are returning the items. Examples might be: too expensive, ugly, did not fit, changed my mind, etc. Please give us an honest reason for the return. This information is used to better serve you in the future. Also, be sure to include your order number and contact information. Return your purchase; postage paid,unused and with the original packing materials and garment tags. If for some reason you can not e-mail us, please include a written reason for the return on the original invoice or on a separate piece of paper. Please allow us up to 30 days to process your return. During the Christmas season it can take slightly longer.